The current Abbey was founded in 1499 and it oozes history despite still being used as a modern place of worship today. The sheer size of the place is the first thing that strikes you when you head through the visitors entrance. The other really noticeable thing is how bright the place is because of the large windows on either side. There are guide leaflets available to explain more about what you can see, but stewards are also available in the Abbey to answer your questions when visiting. Chaplains are present most afternoons during the summer, leading prayers on the hour and Evening Prayer at 3.15pm in the St Alphege Chapel. Group guided tours are available but they need to be pre-booked in advance and are provided by volunteer guides in English these can be tailored to suit your requirements and last approximately for one hour. There are two other areas that you can visit in the Abbey. 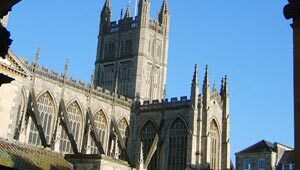 Firstly the tower, which dominates the town, has fully guided “Tower Tours” available which offer a tremendous view of Bath below. Secondly the Abbey has a shop with a mini museum but this is not open on Sundays. Also when leaving the abbey make sure you study the main oak double doors at the front which are superbly carved and very, very old. Bath Abbey is open to visitors in the Summer: Monday to Saturday 9 am – 6pm, Sunday 1pm – 2.30pm & 4.30pm – 5.30pm pm. In the Winter, open Monday to Saturday from 9am – 4.30pm, Sunday 1pm – 2.30pm & 4.30pm – 5.30pm. Also open for regular services. There is no admission charge, but donations are appreciated. You can download a free audio tour of the Abbey for your MP3 player via the Abbey website – see the links below.